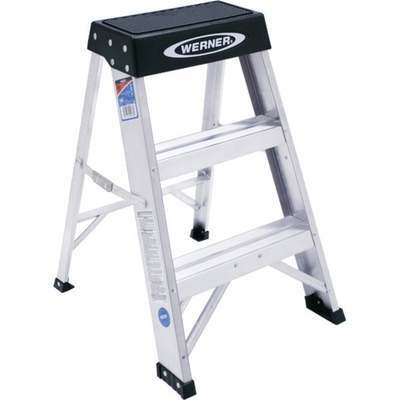 Industrial grade step stool that is perfect for most plant, office, and home applications. Lightweight, sturdy, and compact. Has a molded black plastic top that provides a wide standing platform. Features pinch-proof spreaders and slip-resistant feet and steps. Dimensions: 17 In. W. x 2 Ft. H. Steps: 3 In. wide. Type IA heavy-duty industrial rating 300 Lb.